Why settle for the hustle and bustle of a mall? You can find all of your favorite retailers in Lake Tahoe, where a day of shopping means fresh air and open spaces. Grab a souvenir, a nice summer hat or any items you forgot at home. From luxury to necessity Lake Tahoe is a shopper’s paradise. The Lake Tahoe region is big. It’s so big in fact that you might not be able to tackle all the shopping it has to offer in one weekend. Before you start shopping, scope out our regions, find your favorite stores and boutiques and plan your weekend, one shop at a time. 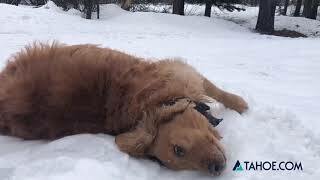 So you want to find a Lake Tahoe T-shirt, a Lake Tahoe hat or a Lake Tahoe-emblazoned hoodie? You’re SO not alone. It seems like almost everyone who visits the area wants to take home something that says “Lake Tahoe” on it. And why not? Chances are, this is the best vacation you’ve ever had, and you’d like to have a memento. At the very least, take home a Lake Tahoe souvenir. Lake Tahoe wouldn’t be the destination resort of choice for so many people world wide if it weren’t for the surrounding villages: Truckee, Squaw Valley and Northstar, to name a few. If you’re en route to the Tahoe basin or looking for an afternoon excursion into the mountains, these alpine resort towns are sure to leave you feeling relaxed and well-cared for. 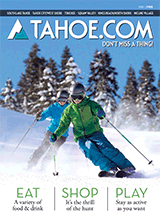 Check out shopping in every area of the Lake Tahoe area. If you’re still wondering which side of the lake to tackle first, check out our shopping guides. You’ll also find that outdoorsy shops sell bikes and water sport gear in warm weather, and ski and snowboard equipment as the seasons change, adapting to fit the incredible diversity of the region’s residents and visitors. Just as appealing is the South Lake shopping scene. South Lake Tahoe is a mecca for the day shopper, the marathon shopper and the casual browser alike. If you’re looking for some vacation knickknacks, South Lake Tahoe souvenir shops rival them all. Designer apparel to beachwear, cosmetics to wedding rings, South Lake Tahoe shopping covers all the bases. Lake Tahoe is known for quality thrift-store shopping. Find a great deal on a lightly used fleece, down jacket or hiking shorts at one of these quirky stores. Browse antiques and find treasures at Lake Tahoe thrift stores. Need a Gift for That Birthday, Bar Mitzvah or Wedding? Lake Tahoe has a great selection of gift and boutique stores, fit for your gift-buying needs. From wrapping paper to jewelry and apparel, you can find the right gift at the right price. Make your visit stand out with a t-shirt! Browse Lake Tahoe t-shirt shops for shirts and other souvenirs.